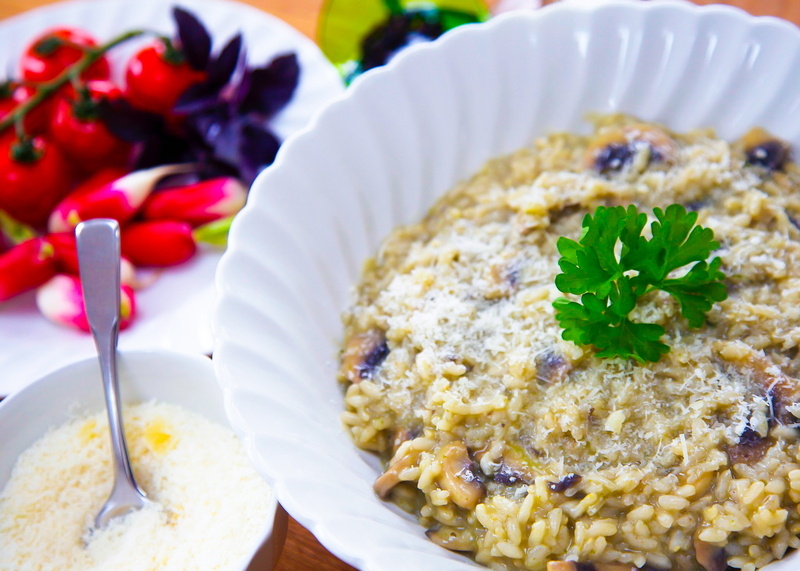 A creamy, comforting dinner and a good source of B vitamins and minerals from the mushrooms. Add a salad of mixed leaves, sprinkled with pumpkin and sunflower seeds for a deliciously balanced meal. Peel and bash the garlic. Peel and slice the fresh mushrooms. Wash and chop the parsley. Heat the oil in a wide saucepan over a medium heat. Gently brown the garlic. Add the sliced mushrooms and parsley and cook for 2 minutes. Chop the soaked porcini and add. Strain the soaking liquid into the simmering stock. Carry on cooking the mushrooms for about 5 minutes or until the liquid given out by them has evaporated. Add the rice and stir well to coat. Add the wine and stir continuously until it has been absorbed. Turn off the heat and stir in the butter and grated parmesan. Cover the pan with a lid and leave the risotto to rest for a couple of minutes.